Frida Kahlo 2003 iphone x case by Jerrold Carton. Protect your iPhone X with an impact-resistant, slim-profile, hard-shell case. The image is printed directly onto the case and wrapped around the edges for a beautiful presentation. Simply snap the case onto your iPhone X for instant protection and direct access to all of the phone's features! 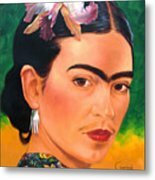 Really great Kahlo portrait, Jerrold!! Congrats on your sale! Christel. Congratulations on your sale, Jerrold:)! 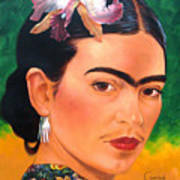 Love your expression of Frida! WONDERFUL color and depth! 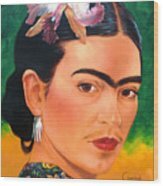 I believe Kahlo herself would be applauding your work. Truly EXCELLENT! In my favorites! Jerrold Simply Beautiful! Congrats on your sale to! Great work...... Congrats on your sale, Jerrold ! Congratulations on your sale! a most beautiful rendition of Frida ... love it!